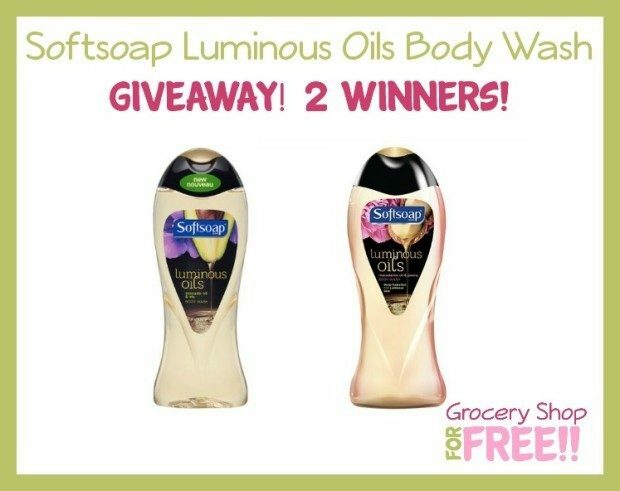 Softsoap Luminous Oils Body Wash Giveaway! 2 Winners! You are here: Home / Expired / Softsoap Luminous Oils Body Wash Giveaway! 2 Winners! Have you had the chance to try Softsoap’s Luminous Oils Body Wash? I am always looking for body wash that doesn’t leave my skin feeling “pulled” and dried out, so I was excited to get to try these Luminous Oils! You can feel the oil the minute the body wash hits your body. I loved the feel of it, I didn’t feel like it was drying my skin out, at all. In fact, I kept thinking of the word luxurious. It really lathered very well and the scent lingered well after. I was definitely surprised that even hours later I felt as though I had applied lotion afterward, and I had not! So, for a time saver – which we can all use. I know sometimes as Moms our shower can be a great place to think things through and to “get away” for a few minutes (even when they are knocking on the door asking us when we’ll be done because they need us). For me, the added time to apply lotion, wait for it to “soak in” and then get dressed is time I often don’t have. So, I love that this will remove one step for me! My favorite scent was the Avocado Oil & Iris. This is one body wash I will definitely be adding to my regular routine. I am so happy to have found exactly what I was looking for, thanks Colgate-Palmolive for sending me these to try out! So, how would you like to try them? 2 lucky winners will each receive 2 bottles of the same scents I received! To win Softsoap wants you to leave a comment and share how you make the most of your shower. Whether it’s exercising your vocal cords, planning your day’s wardrobe or simplifying your cleansing routine with the new Softsoap Luminous Oils Body Washes, there are endless possibilities to maximize your time. I never thought much about making the most of my shower – I usually hurry in and out because my skin is dry and my dermatologist says to make it quick. I do spend my little time in there planning my work day.